The period from 1898 to 1923 was a particularly dramatic one in Spanish history; it culminated in the violent Barcelona "labor wars" and was only brought to a close with the coup d'etat launched by the Barcelona Captain General, Miguel Primo de Rivera, in September 1923. In his detailed examination of the rise of the Catalan anarchist-syndicalist-led labor movement, the author blends social, cultural and political history in a novel way. He analyses the working class "from below" and the policies of the Spanish State towards labor "from above." 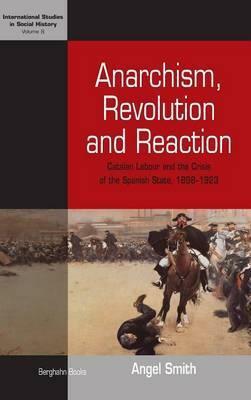 Based on an in-depth usage of primary sources, the author provides an unrivalled account of Catalan labor and the Catalan anarchist-syndicalist movement and thus makes an important contribution to our understanding of early twentieth-century Spanish history. Angel Smith in Senior Lecturer in Spanish History at the University of Leeds. He has worked extensively in the areas of Spanish labor and Spanish nationalisms. His books include An Historical Dictionary of Modern Spain (Scarecrow Press, 1996), Clare Mar-Molinero and Angel Smith (eds), Nationalism and National Identity in the Iberian Peninsula. Competing and Conflicting Identities (Berg, 1996), Angel Smith and Emma Davila-Cox (eds), The Crisis of 1898. Colonial Redistribution and Nationalist Mobilization (Macmillan, 1999), Stefan Berger and Angel Smith (eds), Nationalism, Labour and Ethnicity, 1870-1939 (Manchester University Press, 1999), Angel Smith (ed), Red Barcelona. Social Mobilization and Labour Conflict in the Twentieth Century (Routledge, 2002).